September 4, 2013 Searching for a sustainable suckler strategy? What does it take for a sustainable future for a suckler cow enterprise? 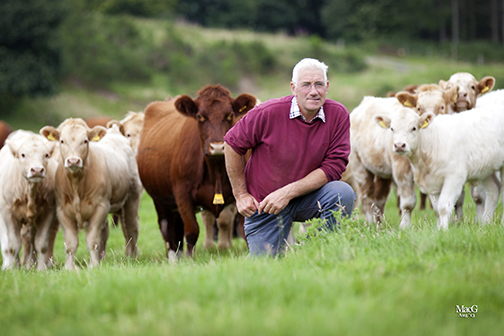 According to SAC beef specialist Ian Pritchard, the answer lies in maximising output per unit of her body weight. That means accurately matching cow type to environmental conditions before selecting the correct terminal sire to drive profits with minimal inputs. “Suckler keepers need to evaluate the cow type they keep and check that they are ‘pulling their weight’; there is no room for passengers,” he said. Mr Pritchard judged the Morrisons Beef Shorthorn Suckler Herd of the Year Award 2012 and found among his finalists Iain and Sarah Malcolm, who he says were farming an exemplary herd by maximising output from their own resources complemented by huge attention to detail. 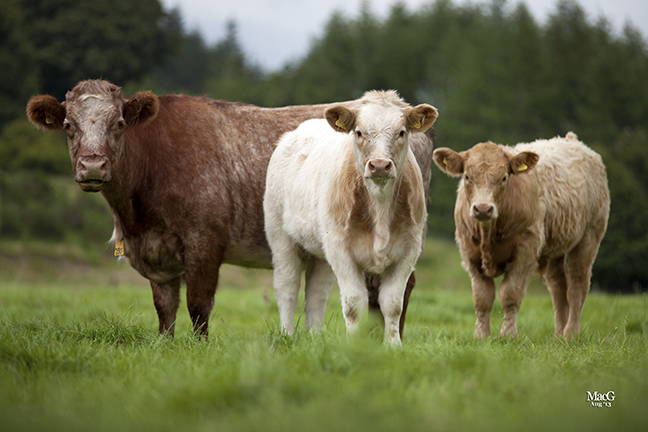 The Malcolm’s Callander, Perthshire based Beef Shorthorn cross herd achieved a minimum rearing percentage of 91%, a tight bulling period of eight weeks with 100% calving outdoors on target and 74% within the first three weeks. In addition, calves were reared to a profitable sale weight with a daily liveweight gain of 1.2kg per day from milk and grass alone, creep was introduced in the last fortnight before weaning at six months. “In a difficult year like 2012, performance had to be good – this farm, as usual, had to sell all of the calves shortly after weaning.” Steers averaged 275kg and £620, and heifers, 265kg and £580, and were within the top 10% through Stirling and Oban markets. The herd’s all year round foraging ability has also brought massive savings to the Malcolm’s fixed costs. Machinery and equipment and subsequent depreciation costs have been minimised to one 80hp tractor, grass topper, lime spreader, direct drill, post driver and three quad bikes. Outwintering the herd means no investment in accommodation has been required. • The Malcolm family is hosting an open day on 13 September organised by the Beef Shorthorn Society, British Charolais Cattle Society, Highland Cattle Society, NFUS and SRUC. Charolais cross calves at Cromlix.